This program draws the entities in a shapefile, containing latitude and longitude polygons or polylines, on a map projection. To draw the shapefile entities automatically, no matter what kind of values the polygon vertices have, and without a map projection, set the AUTODRAW keyword. It is assumed a map projection command has been issued and is in effect at the time this program is called. Alternatively, you can use a cgMap object, which will set up the map coordinate space and provide the map structure required for plotting in that XY map coordinate space. If the ATTRVALUES keyword is undefined, all entities are drawn, but only a single value for COLORS, FCOLORS, FILL, LINESTYLE, and THICK is allowed. Written by David W. Fanning by modifiying DrawStates to be more general, 13 May 2010. DWF. Added the AUTODRAW keyword for automatic drawing. 15 May 2010. DWF. Added COMPILE_OPT idl2 to make sure all loop variables are longs. 5 July 2010. DWF. Corrected an aspect ratio problem with AUTODRAW and upgraded to Coyote Graphics. 3 January 2011. DWF. Previous method of freeing entity pointers took 10 times times longer than freeing pointers as I go. Also added MinNumVerts keyword to screen out the drawing of small polygons. 6 October 2011. DWF. Wrong string case for discovering particular attributes caused them not to be drawn. 27 Oct 2011. DWF. Added the ability to draw point shapefiles. Changed default color to "opposite". 20 Aug 2012. DWF. Made sure a window is open when the default color is chosen. 29 Aug 2012. DWF. Added a DrawMapCoord keyword so that shapes in a different map projection can be drawn on a map correctly. 29 Nov 2013. DWF. Changed the default value of the USELIMIT keyword to 1. Mostly, because I've been burned too many times to think a default value of 0 makes sense. 29 Nov 2013. DWF. Draw the shape file entity on the map projection. This program draws the entities in a shapefile, containing latitude and longitude points, polygons, polylines, or polypoings on a map projection. The shapefile entity that is read out of the shape file. In should be a polygon or a polyline. The name of the color used to draw the entity. Used as fill color for filled symbols when drawing points. The name of the color used to fill the entity. Used if the FILL keyword is set. Set this keyword to fill the entity with a color. Set this keyword to the line style type to draw the entity. A map coordinate object (e.g., cgMap). Required to draw the entity on a GCTP map projection set up with MAP_PROJ_INIT. The program assumes the shapefile entities are expressed in latitude and longitude values. If the entiites are expressed in projected XY Cartesian coordinates, then set this value. When drawing points, the symbol to use. May be any value supported by cgSymbol. The default is a filled circle, filled with Colors. The default symbol size. Used only when displaying points. The thickness of the line used to draw the entity. This program draws the entities in a shapefile, containing latitude and longitude points, polygons, polylines, or polypoings on a map projection. Values may also be in projected meter space, if the proper map coordinate object is passed to the program (e.g, via the MapCoord keyword). To draw the shapefile entities automatically, no matter what kind of values the polygon vertices or points have, and without a map projection, set the AUTODRAW keyword. The name of a shapefile. If this variable is not provided, the user will be asked to select a shapefile with the normal file dialogs. Set this keyword to add the command to a cgWindow. If set, the shapefile entities are examined to find the X and Y boundaries and a data coordinate space is set up to display the entities automatically. If the shapefile is drawn automatically, the restriction that the shapefile vertices be in latitude and longitude values is removed. Do NOT set this keyword, if you are using the MAPCOORD keyword, too. If no map projection is currently in effect (!X.TYPE NE 3) and no map coordinate object has been provided, this keyword is automatically set. The name of the attribute in the file that you wish to draw. By default, this is set to the first attribute name in the file. If you are unsure of the attribute names in your shapefile, use the Coyote Library program cgShapeInfo to browse the file ahead of time. The value of the attribute identified by ATTRNAME. This variable can be a scalar or vector string array identifying a subset of attribute values to be drawn. For example, if ATTRNAME='STATE_NAME', then ATTRVALUE can identify the particular states to draw. 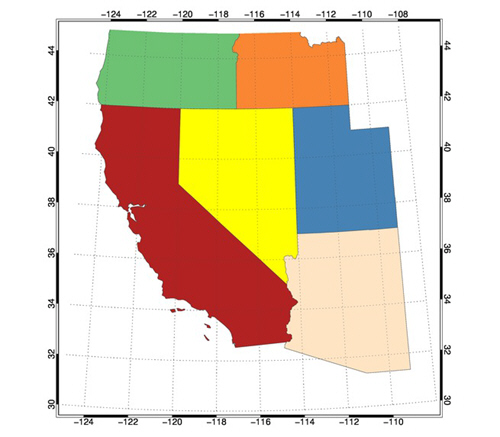 For example, ATTRVALUE=['ARIZONA', 'WYOMING', 'OREGON']. By default, the value is "ALL", which means that all of the shape entities identified by ATTRNAME will be drawn. The name of the color or colors used to draw the entity. This may be a string array of the same size as ATTRVALUES. A map coordinate object (e.g., cgMap) that describes the map projection and datum on which the shapes in the shapefile will be drawn. If not supplied, the map coordinate object passed with the mapCoord keyword will be used. Use this keyword only if there is a mismatch in the map projection and datum used in the shapefile and the the map projection and datum that the shape is to be drawn onto. The name of the color used to fill the entity. Used if the FILL keyword is set. By default, the same as the COLORS keyword. The normal linestyle keyword index to choose plotting line styles. By default, set to 0 and solid lines. May be a vector of the same size as ATTRVALUES. A map coordinate object (e.g., cgMap) that describes the map projection and datum used in the shapefile. If drawMapCoord is not used, this is also the map coordinate system used for drawing the shape or shapes in the file. This keyword is required to draw the shapes on a GCTP map projection set up with MAP_PROJ_INIT. Note that this could also be a map structure as returned from MAP_PROJ_INIT, but in that case the user is responsible for setting up the XY map coordinate space independently and outside of this program. Set this keyword to the minimum number of vertices required to actually draw a polygon. In other words, to to drawn, a polygon must have at least this number of vertices. Set this keyword to use the LIMIT as determined from the map coordinate object. This keyword applies only if a valid MapCoord object is passed to the program. Set this keyword to add this command to a current cgWindow program. If a cgWindow doesn't exist, one is created.